Follow the journey of a beautiful Oriental rug in Carpet, a gorgeous picture book written and illustrated by Madeleine Meyer. With sparse text and clever illustrations, Meyer records the experiences of the rug over one hundred years, from the days it is woven from vibrant threads through to the days that those threads begin to unravel. 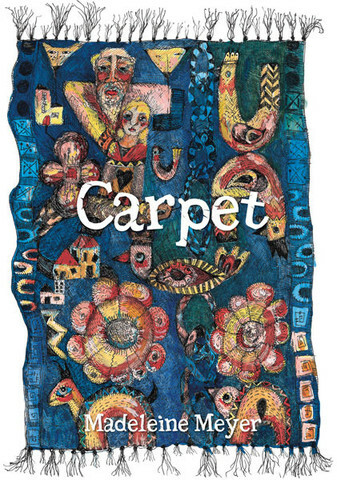 Aside from the rug, which is illustrated in bright, eye-catching colours, the illustrations are predominantly black and white which brings the experiences of the carpet sharply into focus, enhanced by the first person perspective of the story. Carpet stirs the imagination as readers see the passing of time and activities of people from the rug’s perspective – family gatherings, formal dinners, dancing, laughter, games, sadness and the changing seasons. The story offers many opportunities to start conversations with children about changing social customs and the way we value, or stop placing value, on objects. There is also a sense of the circle of life as the carpet is made, used, and gradually unravels. A beautiful book sure to be enjoyed by thoughtful readers.